What Wild West Faro is all about? Whether you’re bored with other card games or want to experience a game that was popular in the Old West. Wild West Faro is the perfect game for you. Well-known as “bucking the tiger” and “twisting the tiger’s tail”, this Faro card game app breathes life into this old game and brings the playing table to all Android and iOS users. This is a classic Faro game, with the same rules and goals. The betting layout consists of a suit of Spade cards, from Ace up to King. As a player you can bet on a card of your choice or multiple cards. The Dealer would then expose the cards in pairs, a winner and a loser card, and then pay out or collects accordingly. You can also cheat, parlay a bet, use bonus joker cards, view detailed game stats, bet on one or multiple cards, break the bank, etc. 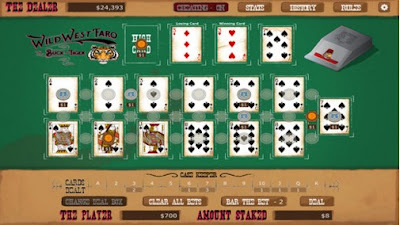 Sit on this Faro table, place your bet from $1 to $1 million and feel like a real Old West gambler by downloading this amazing game from the links we’ve provided for you below.